Ah, the summer of 2000….so young, so free. Riding around town listening to Destiny’s Child jams (not joking), working at the Puyallup Fair greenhouse, finding any and every excuse to get out of the house for the evening and doing my best to stay out of too much trouble- was a wonderful life. 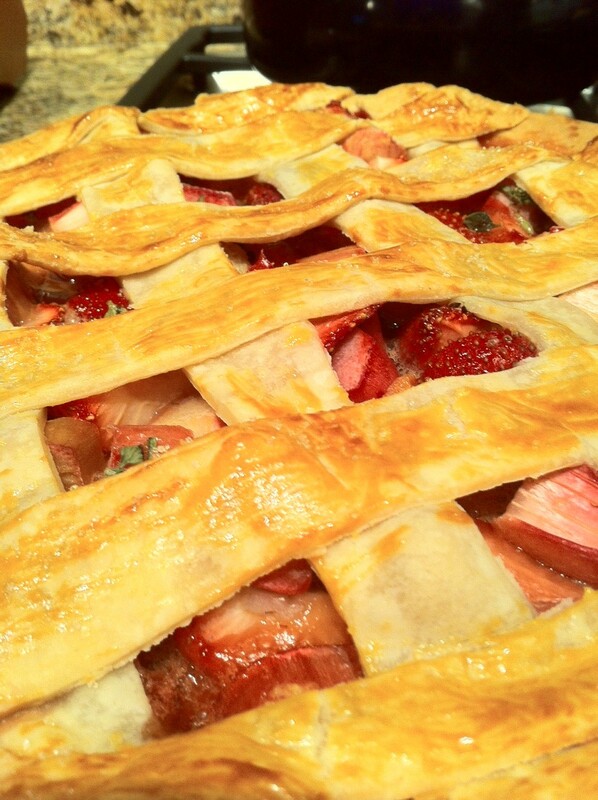 Also that summer I made my very first Strawberry Rhubarb Pie and I will always remember how delicious it tasted! 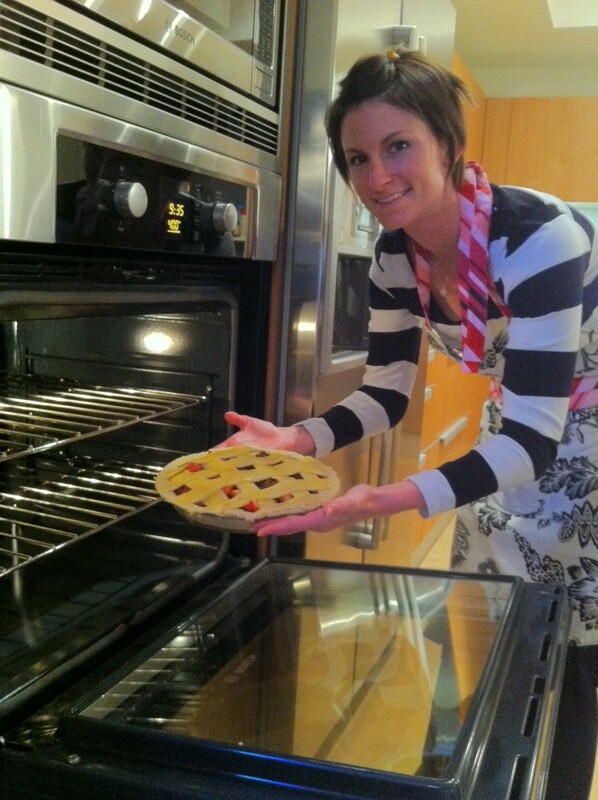 Placing the pie into the pre-heated oven. I just bought Philadelphia Pie Crust but I promise to make my own next time…I was feeling a little lazy. Roll out each roll of dough on a floured surface and place one in a 9″ round. Trim the excess dough and set aside. Cut the leftover dough into ten to fourteen 1/2″ to 3/4″ wide strips to form a lattice crust. Then combine all ingredients in a large bowl, tossing gently to blend and spoon into the pie crust. Mark made two mini Rhubarb pies in a cupcake dish with the left over crust and filling. 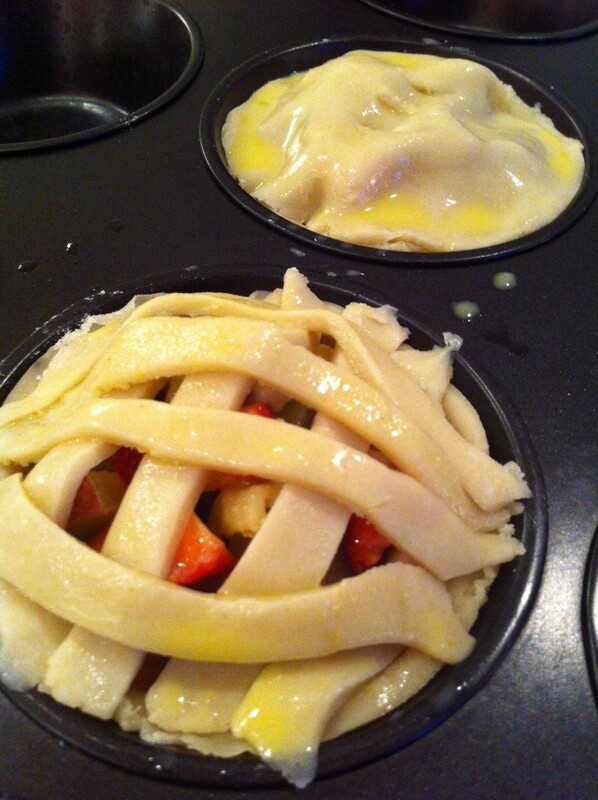 Form the lattice crust by laying 5-7 strips on top of the filling parallel with each other. Then rotate by a quarter turn and lay the remaining strips down parallel with each other. Make an egg wash with 1 large egg yolk, beaten and blended with 1 tsp water. Glaze the crust and sprinkle with sugar. Transfer the pie on to a baking sheet (important- if you don’t, you might end up with an oven mess!) and bake for 20 minutes. Reduce the heat to 350 degrees and bake for another 25-30 minutes until the pie is golden and the filling thickens. Remove and allow the pie to cool completely. If you have a bunch of liquid standing, not to worry…as it cools, the liquid will thicken.